Note: Bay of Islands is an anchorage port. Passengers transfer to shore via ship's tender. It was here in 1840 that the Treaty of Waitangi was first signed between Maori and the British Crown. 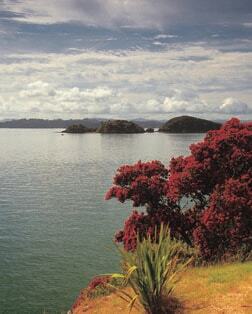 This historic site offers a commanding view of history and the Bay of Islands. Also known as Kemp House, Mission Station is New Zealand's oldest kauri building, completed in 1822. Nearby sits the Stone Store, a former trading post and New Zealand's oldest stone building. A cruise aboard a catamaran sets the stage for fun in the sun. Sail through the Hole in the Rock, a 210-foot hole carved by wind and waves. The family owned Kawiti Cave tours were first established in the 1950's by Te Tawai Kawiti, Great grandson of the famous Maori Chief, Kawiti. The limestone cave system is home to thousands of glow worms spread across the ceiling surrounded by breath taking stalactites and stalagmites. Canoeing and kayaking amidst the beautiful water are just some of the incredible outdoor activities you can participate in the Bay of Islands. Learn about the history, traditions and contemporary lives of the indigenous Maori people who inhabit the Bay of Islands. Experiences include Marae life and travelling by waka canoe which are brought to life by descendants of the original families.